How To Create QuickBooks Payroll Annual Report ? QuickBooks Payroll software initiates all payroll tasks of the user and effectively completes them without leaving much scope for errors. Not only day to day payroll tasks, but Payroll taxes can also be processed with QuickBooks software at hand. These payroll tasks are grouped together under a report wherein all the imperative details regarding the company’s employees and payroll are provided. The information relating to payroll expenses and taxes are also included within the reports. Certain reports generated are specific for the current employees, their earnings, time off balance and payroll. If you are using QB payroll first time , first find the details How to Create Payroll Reports in QB . What Need To Be In Yearly Payroll Report QB ? Below is a list of payroll reports provided to the users. These reports not only offer information regarding the expenses incurred with payroll but also respective liabilities and other important payroll deals. 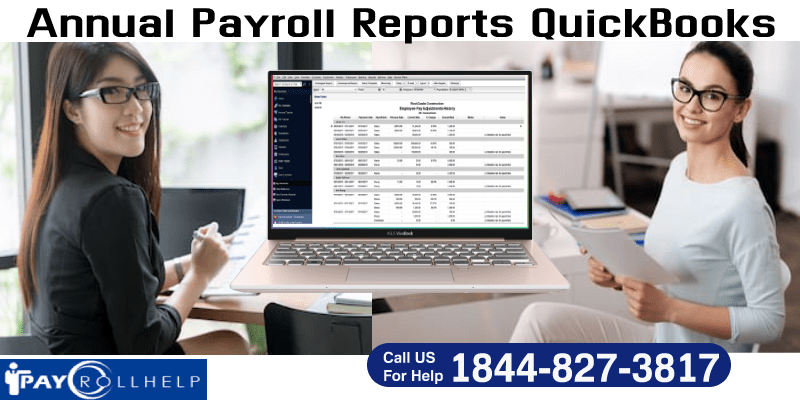 Payroll Item Detail: The report generated under Payroll Item Detail basically provides an overview of all the recent payroll transactions made under one particular payroll item. Payroll Summary: The Payroll Summary Report showcases users what the accumulated totals for all payroll items on each employee’s paychecks. Payroll Detail Review: The Payroll Detail Review Report shows users what values are being used to calculate each payroll items on the employees’ paychecks. Payroll Transactions by Payee: The Payroll Transactions by Payee Report tells the net pay of each employee and what checks were cut for the payroll taxes and other payroll-related expenses. Payroll Transactions by Detail: The Payroll Transactions by Detail Report gives users a step by step breakdown of all payroll transactions by employees. Payroll Liability Balances: The Payroll Liability Balances Report showcases users the payroll taxes that their company owes and user can easily create QuickBooks Payroll Liability Report . Payroll Item Listing: The Payroll Item Listing Report offers users the latest details for all the payroll items for their company. Employee Earnings Summary: The Employee Earnings Summary Report shows users the total earnings and deductions for each employee. Employee State Taxes Detail: The Employee State Taxes Detail offers users the details pertaining to the wage and withholding for state payroll taxes. Also user can easily Run QuickBooks Payroll TAX Report . Jobs, Time & Mileage Reports: These reports offers users details regarding their job estimates along with amount, time and mileage spent for each job. Learn full process of QuickBooks Payroll By Job Report in easy steps . The above reports are imperative to have a clear overview of all the payroll transactions and dealings made over one financial year. However, if faced with any issues, user can call the QuickBooks customer care support team set up by Intuit who are proficient in tackling all sorts of QuickBooks payroll issues. They are extensively knowledgeable and intensively trained to interpret and resolve all payroll issues faced with QuickBooks. In case the connection with QuickBooks Payroll support team is unable to get established alternative support agency can be called on by the user through live chat at QBPayrollHelp and call via toll free number – Phone: 1844 827 3817 . Do You Need QuickBooks Payroll Help for Technical Issues?